Home » Giveaways » Win an Extra Thick Rare & Vintage Chocolat Egg! Win an Extra Thick Rare & Vintage Chocolat Egg! A delicious Hotel Chocolat giveaway worth £29! I’m delighted to be able to offer one of my UK readers one of these rather fantastic extra thick Easter eggs from Hotel Chocolat! Perfect for the chocolate fan in your life these 390 gram half 85% dark Saint Lucia, half 65% Supermilk Colombia Easter egg come filled with single-origin praline and caramel chocolates. Rare & Vintage is an egg of two generously proportioned halves: creamy yet smoky 65% Supermilk Aracataca, Colombia with notes of dulce de leche and 85% dark Saint Lucia with a red wine profile. They’ve wrapped it in gold foil for a glint of anticipation when you untie the ribbon and lift the lid, then filled it with single-origin pralines and caramels wrapped in tissue paper for a little mystery. Can’t wait? This year’s egg contains Crispy Caramel Praline, Hazelnut & Orange Praline, Hazelnut Praline and Salted Burnt Caramel. With a retail price of £29 and standard delivery from £3.95 (or reserve for collection in-store) this Easter egg will be sure to impress. For your chance to win an Extra Thick Easter Egg – Rare & Vintage from Hotel Chocolat worth £29 enter using the Rafflecopter form below. Come back and tweet about the giveaway every day for more chances to win! This giveaway is open to UK entries only. Entrants must be age 18 or over. The winner will need to respond within 30 days of being contacted; failure to do this may result in another winner being selected. Note, in order to receive the prize before Easter the winner must respond with their contact details by the 10th of April. The prize is offered and provided by Hotel Chocolat. The prize is to win an Extra Thick Easter Egg – Rare & Vintage from Hotel Chocolat worth £29. There is no cash alternative and the prize is not transferable. However, due to stock issues, this egg may be replaced with another Extra Thick Easter Egg. Closing date is midnight (that’s 00:00 hours, 12 am on Thursday night/Friday morning) on Friday 7 April 2017 (GMT). The winner will be announced afterwards. Elizabeth’s Kitchen Diary received a complimentary Rare & Vintage Easter Egg from Hotel Chocolat. This is not a paid post. All thoughts and opinions expressed are our own. I’d love to win this for my mum to treat her, she deserves it! I would like to win this for my daughter Betsy, aged 13, and her friends who are having a sleepover at my house in the Easter holidays. I would love to win for my sister, brother in law and niece to share. They would love it! I’d love to win this for my darling husband – Happy Easter ! Love to enjoy a piece of luxury over the easter period. For my Wife and daughter who are always treating me with lovely homemade cakes! I’ll give this to my wife & kids to share. I seriously picked the wrong time of year to start a diet! I would love to win this for my partner. It is something that he would really appreciate. This Easter egg looks and sounds like pure indulgence, I couldn’t not enter! For my husband and myself, as my kids are not big fans of dark chocolate. These flavours sound amazing. I would like to win it for my husband. He doesn’t often eat chocolate and so he gets overlooked when we buy some. It would be a lovely surprise for him. I love it for me, mine all mine, I’d shut myself away and stuff my face. Would love to win for my son, studying hard at university – might help with revision too! I want to win this Easter egg for me because I am special. I’d love to win this for my daughter so she can pamper herself after my granddaughter has gone to bed. I want to win this Easter egg so I can share it with my family. My other half has slipped a disc in his back 7 weeks ago. He’s the biggest chocoholic I know and I’d love to give him this as a little treat. Is it socially acceptable to say that I would like to win it for myself? I’d like to win it for my husband because he is soooo lovely, he deserves a treat. And what a treat this would be!!! I would love to win for my mum she loves an easter egg. I would love to win this for my best friend.She would really appreciate a little treat to cheer her up! I love to treat my five wonderful grandchildren to some delicious chocolate and they would love this! I’d love to win this egg to share with my visitors who are all adults with sophisticated taste who would appreciate the taste of darker chocolate. We might even serve this with a really good wine. FOR MY HUSBAND. HE LOVES CHOCOLATE AND ALWAYS HAS SINCE HE WAS AN EGG HA HA. I would give this egg to my husband, he could really do with a tasty treat. I’d love to win this egg for my best friend! She’s just had a promotion at work and it would be a lovely gift for her to celebrate! I want to win the Easter egg for my Mother in Law. These days she is confined to the house;, and it would be great on Easter morning to pop down to see her with such a wonderful present. Will share with partner Martin – fellow quality chocolate lover. Will save a piece for my sweet-toothed and insatiably greedy pony, Rocky! For myself! I’m on a diet, but obviously there are no calories in chocolate that you have won. I would like to win this for me as the kids get plenty! I would love to share it with my mum who hasn’t been too well over the past 6 months. I would love to win this for dad. He is my rock my teacher and my hero who is 86 and beginning to slow down due to his bad back but no less a man. He deserves a chocolate egg that befits a King!! My mum – she really deserves a treat as she’s so good to me. I’d love to win for my fiancé and I to share. He likes plain and I like milk chocolate so it’s the perfect combination. Plus we never buy ourselves eggs just the children so it would be a nice treat. I’d love to win this egg because CHOCOLATE IS LIFE. I’d like to win the Hotel Chocolat egg for my parents as they love quality chocolate. I would love to win this gorgeous egg to share with my chocoholic mum! Fantastic Easter egg which I would love to share with my hubby. My mum because she would love such a good quality Easter Egg. I would love to win it to surprise my granddaughter. She loves chocolate and she would be over the moon! Believe me or not I would love to win for my mother in law. I would love to win this for my fab Mum and Dad. What a treat. Because I haven’t had an easter egg for years, no one buys me one anymore! Share with her lovely daughter….. me!! Love to share this egg with my man, Robert, we deserve it! I would love to win this for my Mum and Dad for them to share as they always buy me easter eggs and rarely get one themselves! my kids they would love this egg it looks amazing !!!! I would love to win this egg to share with my parents, it’s probably too rich for just one person! If I won I’d give it to my Dad.. he’s not been too well lately so deserves a treat. Since I haven’t been bought an Easter egg by anyone for years I would like this treat for myself. I’d love to give this to my partner Martin…if I could bring myself to share it! I’d give it to my husband, but I’d hope she would share it with me! Would make a gorgeous Easter pressie for my daughter when she comes home from Uni for Easter! I would like to win, so I could share this with my 2 girls. I just love Easter Egg Chocolate it just tastes nicer! I’d love to win this for my hubby and myself, children always get eggs at Easter but us poor adults get forgotten about. I just like Easter eggs. I would like to win it for my partner Lee as a treat for putting up with me in my 3rd trimester and I am so moany! He will make a great Dad ! I would like to win the Easter Egg so I can share it with my family. My mum’s birthday is the week before Easter. We will be going on a break together and it would be great to win this egg so we could share it and celebrate both her birthday and being together over Easter. I’m looking after my parents farm so would love to take it round so my son, partner and me could have some. I would love to win this for my mum 🙂 She’s a chocoholic and I buy her an easter egg every year but it’s always a Cadbury one and it would be amazing to give her something this special! I would love to say that I want to win for my children and husband but the truth is, I am a massive chocolholic and would really like it for myself! I would (rather selfishly, I admit) keep it to myself … I feel like I deserve it! I’d love to win because Hotel chocolat goodies are so tasty and made with good quality cacao. I have six grandchildren, all chocoholics! Need I say more? would love to win this for myself,I am a choclate addict ,love the stuff. Is it wrong that I would like to win this Easter Egg for me? I never get any Easter eggs any more and really love them! I guess I would share it with my other half if I won though! I’d like to win it for my Dad. He always buys cheap chocolate, high in sugar and low in taste. I’d really like to win this for me as a lovely treat. It looks so big, thick and chocolatey that I would be able to share it with my husband and daughter for us all to have a delicious Easter treat, yum, yum. My husband. He’s had a stressful year so far and deserves a treat – and he may also share it with me! I’d really like to win this for my boyfriend as he loves dark chocolate, but sadly an egg like this is a bit out of my budget. I’d like to win for the whole family..we’re all massive chocolate lovers! My wife, she loves HC and is always in need of a treat! I would love to win this for my chocaholic sister! I’d love to win for my husband, he’s a chocoholic but for some reason we never buy each other Easter eggs. This would be a surprise he would definitely appreciate. Is it bad to say for myself! lol Im 7 months pregnant and a complete sugar addict , this would be amazing!! For myself, I am a choco addict! My husband, because I know he will share 🙂 . I would love to win this for myself, but I would share it with the other half and kids – honest! Just seen my comment is supposed to be more than 8 words – my last one wasn’t, so if you can delete and let this one stand? I would love to win it for my mum who loves dark chocolate. She’s also celebrating a very special birthday on the 22nd of April so I’d love to win this for her. I’d love to win to share with my hubby – ye right! All the people I hang out with over the easter weekend. I would love to win this wonderful egg for my husband, he loves dark chocolate. I would love to share the egg with my husband. I would love to win this egg and it may sound guilty, but I’d love it for me. I’ve eaten Hotel Chocolat eggs before and it was delicious, so this would be a lovely treat, especially after giving up chocolate for Lent. It looks tasty and I love tasty things! My dad. He would love it! He is a secret chocoholic…just like me. I would love to win this Easter egg for yours truly! I would love to win this egg for my husband, he is a bit of a chocoholic (even if he would deny it) and also I know he would share it with me! I would love to win this amazing egg for my wife! This egg is too good to give to the kids so I’d share with my brother(we both love good chocolate). Is it dreadfully awful to say I wasn’t planning on sharing the egg with anyone? I want to win it for me. You will find me the next day in a chocolate coma with it smeared all around my mouth. This Easter Egg would be given to my friend Alison, who has expensive tastes and only Hotel Chocolat will do! As we live in Cornwall, there is no shop that we can ‘pop’ to, so we only order treats for high days and holidays, because it seems a waste to spend the money on postage! Me! But I will share it (especially with my husband). Mmmm! To be honest I think we’d just share it with family. i’d eat it all myself. all of it. in one go…. I would love to win this Easter Egg for my Mum, to help cheer her up after recently losing her husband to cancer. This would make a perfect addition to my sisters Easter / birthday weekend celebration! I would love to win this chocolate egg to share with my partner and our daughter! 🙂 Hotel chocolat is gorgeous and seems to last longer than other brands because it is so rich. I’d love to win for myself, I absolutely love hotel chocolat, I might give the kids some if they’re really good! I’d love to win it for myself as no one else will get me one! Would love to win this for my daughters to share as an Easter treat, they both love dark chocolate so would really enjoy this egg. My Dad (and me) love dark chocolate. Probably a sharing job, it is pretty big. For my son, who is away at university, and as a poor student can’t afford such luxury! I would like to win this egg for my 3 daughters to share. I would love to win this gorgeous egg for my daughter. She deserves a treat and treats don’t get much better than this! I would love to win so I can give it to my grandchildren to share. I’d love to win this t for my mum and sister. Would be perfect for a girly night infront of the TV! I would like it for my husband, daughter and me, I think there is enough to go round! Would love to win to share with the family. Children are grown up now so we don’t tend to bother buying eggs so this would be fantastic. Hotel Chocolat is the best chocolate around. I would like to win this for my stepdad as he loves Dark Chocolate. I would like to win this especially lovely easter egg for my grandaughter’s pleasure. For myself mainly, but it looks like there is plenty to share with my family. My kids would live this. I don’t think there will be any left for me! Myself I’ve been dieting but said I’ll treat myself to the Easter egg I want over Easter! i would like to win for myself as i am a chocolate addict! Looks nice to take away in my motorhome. For me! Well, no, not just for me, I would share with my partner, and Mum and Dad. My dad particularly loves chocolate too. Good excuse for coffee and a chat. I would love to win it for me to eat when the kids are in bed! I would love to win it for myself, I don’t get many treats and this looks divine, I’m sure my husband will get some as well! I want to win this egg for Janet , a very sweet lady with a very sweet tooth. I would love to win this for my wife, she deserves a special treat! I would love to win for my wife who doesn’t get enough treats for the fantastic way she runs the super smooth household! it`s so tasty this would be for me alone! I’d love to win this for my husband. He just loves chocolate. Unfortunately, I’m trying to make sure we eat more healthily and I think by Easter he’ll be at breaking point! I think I’d keep it for myself as I’m the only one that hasn’t got an Easter Egg. My grandson is a few months old and has had open heart surgery. His parents deserve a treat. I’d like to win it for them. I would like to win it for my sister as she’s been through the mill a bit lately! Very selfish, I’m afraid, but I would like to win it for myself and my husband. We’re both big chocoholics. I would love to win for myself. Just the sound of the pralines is making my mouth water. 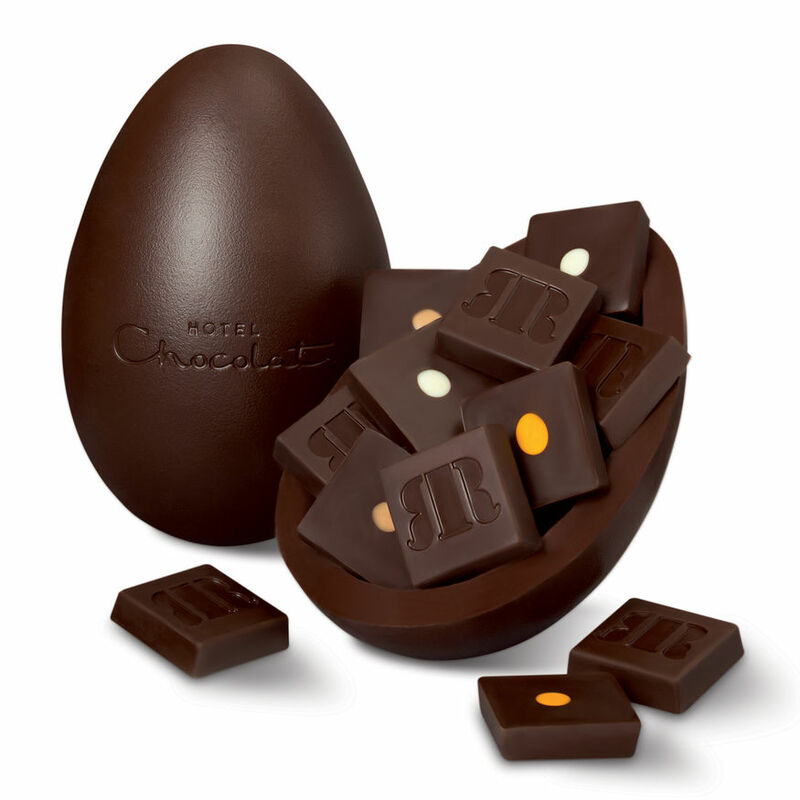 I’d love to win this Hotel Chocolat Easter Egg for my daughter – though I am sure he would share it with us! The whole family. I think it’d take all of us to polish it off. I’d love to win this for my sister – she’s a chocolate fiend! I would give this to my chocoholic husband… although I would make sure he shares it with me! I would love to win this Easter egg for my grandson Jack. I want to have some for myself, always having to share and this looks too good to let go. I would love to win this for my husband – I’m a rotten wife, I never buy him an Easter Egg! Going to be honest, ME! It looks so good. I would love to win this for my dad who loves chocolate and needs a treat! i would share it with the family. I think that we would all enjoy it. My husband deserves a wee treat and I am sure he would share it lol! Both my Granddaughter & Daughter would love this, so I would have a fight on my hands trying to decide. id say for myself but im sure if i won my daughter would have it! Love to win for Hubby and myself. Such an Easter treat. Yummy! i would love to win this for myself, nothing tastes better than real chocolate! I would love to win because after giving up chocolate for lent, I will be in need of some good quality chocolate! THE ONE PERSON WHO I KNOW COULD REALLY APPRECIATE SUCH A GREAT EGG MYSELF!! I think this egg would be perfect for my partner who has to follow a gluten free diet as most of Hotel Chocolat chocolate is gluten free. He may have to share the contents with me ( shame, but I’m sure I’ll manage), but the egg would be a fabulous treat for him. I would love to win this for my son and daughter-in-law. Is it wrong to say me?!!! oh well, me!!!! I’d like to win this for my mum. I know she’s love it. Would love to say I’d share it with my boyfriend or my kids, but if I won I’d have this all to myself! would love to give to my husband as a nice treat! I have to be honest and admit that I would love to win for myself. Just the sound of the pralines is making my mouth water. I’d love to win it for my fiance – this is right up his street! I would like to win this Easter egg for meeeee! My mum- she is such an inspiration and is like the egg: rare & one-of-a-kind. She has been on slimming world since January and has done amazing, she deserves a little chocolatey treat! I would want to win it for myself, as nobody buys me Easter Eggs anymore! I must admit it looks very tasty and chocolately. so I would probably share with my flatmate Irina. I would love to win this for my Wife…….and me! For myself! I love hotel chocolat treats! I would like to say that I will share it out but really I would love to win it for myself 🙂 Big fan of dark chocolate! Lovely giveaway. I would love to win this for my husband who works very hard and looks after me too. I would love to win this Easter egg for my children to share, as they would really enjoy it, thanks. I would love to share it with my children and parents.